Fill a medium pot with water, add quinoa and salt to taste and bring to a boil. When the water boils, reduce heat to low and cover; simmer covered 15 minutes. Remove from heat and keep covered an additional 5 minutes without lifting the lid; then fluffwith a fork and set aside in a large mixing bowl to cool. While the quinoa cools, dice all the vegetables. Add the red onion, basil, ½ cup buffalo mozzarella ,and tomatoes to the cooled quinoa, and squeeze 1/2 lemon over it. Take mixture and place in an 8X8 glass container. 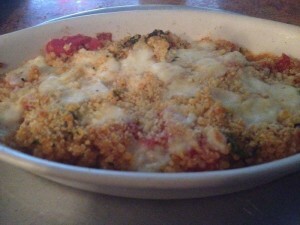 Top mixture with remaining ½ cup of buffalo mozzarella and bread crumb. Cook in over at 350F for 15-20 minutes. Serve with fresh fish or a nice steak and enjoy!